MCKINNEY, Texas – April 5, 2017 – Sigmetrix, global experts in GD&T and mechanical variation, announced the latest solution in their product portfolio – EZtol. This 1D analysis tool is designed to enable designers and engineers to quickly understand the impact of part and assembly variation on the fit and performance of their products. Why a 1D analysis tool when Sigmetrix already offers a more robust analysis tool, CETOL 6σ, capable of predicting the impact of more complex 3D interactions that occur in production? Engineers often use hand calculations or spreadsheets to conduct tolerance stackup analyses, but unless they are specifically considering more complex interactions like the rotation of surfaces their calculations may not fully account for all the variation that can occur in the critical functional requirements. EZtol not only performs these 1D stackup analyses far more efficiently than manual methods with the numerous additional benefits mentioned below, but it can also detect many scenarios where 1D treatment may be insufficient. When such scenarios are identified a caution symbol is added to the results row as well as a note to indicate that the calculated 1D results may be underestimating the actual variation the design will have during production. 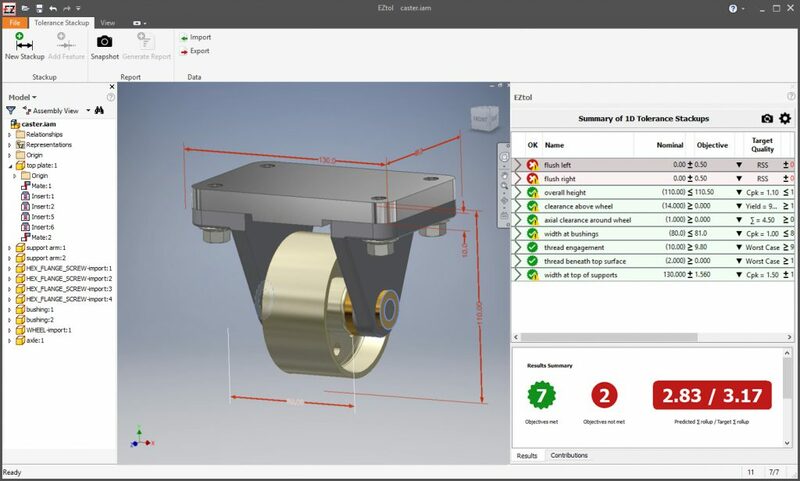 Users can then decide whether or not to use more advanced tools like CETOL 6σ to get a better understanding of how the design will actually behave. No other solution available on the market today combines the ease of use of EZtol with a visual indication of the limitations of 1D treatment of the tolerance stackup. Uses the actual nominal distances between surfaces/features from the design. Helps to ensure all components in the loop are included. Shows the optimum dimensioning scheme for the single analysis. Want to check it out now? You can download a free early preview this month to review and provide feedback: www.eztol.com.